It's not so hard if you can get away with just moving your music/videos/images to the HDD. It's much harder if the data you work with is absolutely massive, though. One artist I know has a SSD as their boot drive, and 3 HDDs. The PSDs they work with are absolutely massive, and they produce a huge number of them. Working with them on the SSD is far better than the HDDs, but even loading them on that is a bit on the slow side (as opposed to the multi-minute loads from an HDD). But, they have far too many to fit on the SSD. So they have the PSDs spread over the 4 drives, filling most of them up, having to manually shuffle them around. Something like Fusion Drive would work far better, as it would be doing exactly what she's doing, just without the manual effort to constantly move old files off the SSD (resulting in multiple hierarchies). The older PSDs would be migrated to the HDDs automatically. And if she starts working on an old set again, they could be promoted back to the SSD... with no user effort. If your friend has a mac, and if they can borrow enough temporary storage (to copy and hold the files while you make the change over), what I would recommend is that they stripe their 3 HDs together as a single volume. This can be done easily enough using the Disk Utility GUI. (Honestly they should have enough temporary storage anyway, in the form of Time Machine backup). This will give a single volume (less moving around from one place to another) with 3x the bandwidth (as long as each hard drive is connected to a distinct USB or FW port). [If the drives are of different sizes, and you don't want to waste the extra space, it is still possible to use them this way, but you will need to use the command line. Assume you have two drives, one of 300GB, one of 400GB --- the extension to more drives is obvious. You partition the 400GB drive as a 300GB and 100GB partition. (c) create a concatenated volume from the volume created in (a) and that created in (b). Not a perfect solution, but a substantial improvement on the situation right now. Really this seems like a solution for the lazy or technically naive. Manually managing your SSD/HD resources allows you to speed up based exactly on your own priorities, instead of having some software guessing and making a bunch of unnecessary copies to/from the SSD/HD. You get faster performance of pure SSD where you want it. Less hiccups from background reorganization, and less unnecessary stressing of the SSD. "Really this seems like a solution for the lazy or technically naive." 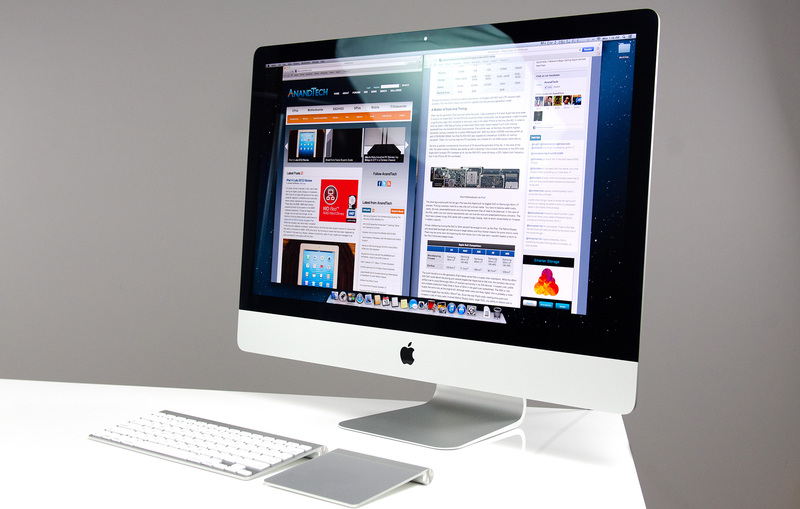 Apple's principal market, especially for the iMac, is to home and small business users. Once again dragging out the familiar, but still applicable, automotive metaphor, I'll point out that most people don't want to work on their cars. They just want to drive reliably to wherever they're going. That's the need that Apple's FD addresses, and it seems to do so rather well. Sure, the price adder is a bit higher than one might hope, but probably not so much that it'll frighten away prospective buyers. Interestingly though, it lost our sale. I was ready to order another iMac with a 256GB SSD and a 1TB HD for the office. We keep most of the files on the server, but a 128GB SSD application/boot drive is a bit tight. However a 256GB SSD is just right, allowing plenty of free space to maintain SSD performance. The additional 1TB HD is then repurposed for local Time machine backup. But that's not an option for the new iMac, which offers only HD or FD. And I'm not about to make a risky and warranty busting expedition into its innards in order to roll my own SSD solution (although my own MacBook Pro has a self-installed 512GB SSD). Wasn't this the kind of thing said about virtual memory in the 60's and 70's? Some people back then thought manually managing the location of everything in memory would make things more efficient, until some guys at IBM (or was it Bell Labs?) showed you saved heck of a lot more time letting the machine do it instead of trying to move things around yourself. This Fusion Drive really does reminds me of virtual memory. RAM and HDD mapped in a way so it appears as a single type of memory. Most stuff gets placed into RAM first, some stuff spills over onto the HDD, and stuff gets copied back and forth depending on how frequently it's used. The fast RAM is first priority, but there's the HDD as kind of a backup. It's a bit different from a caching setup, where the computer has to "guess" a bit more about what should really be on the SSD. It's like the HDD is priority here, while the SSD is secondary. Great comment ThreeDee9. Someone with a rational mind. To all those "experts" who claim that it's better to manage it yourself, you can also write every program in ASM. It'll be fast and small, but I'll be done with the project in 1/10 the time. The point is .... the product is not meant to provide "absolutely the best possible configuration". It's meant to be best all around solution.